In a true Montessori the child is the curriculum and the adult is a guide who gently helps when needed. This is a paradigm shift in the mindset as the child is given immense respect and not treated as a helpless individual. Typical daycare centers have adult-set schedules in which children are shuffled into a new activity every 20-40 minutes: circle time, followed by art, followed by outside play etc. So every child is required or expected to do the same activity (irrespective of whether it serves the child’s needs or not!). Instruction happens in a group setting, at a group pace, even if some children move more slowly or more quickly. In contrast, the Montessori toddler/primary program supports a child’s development by letting him explore himself or herself at a pace that is developmentally unique to the child. Children have the luxury of time to choose their own activities, and to fully explore them at their own pace. Most instruction is one-on-one: teachers give short 5-minute presentations to individual children, after which they are given an opportunity to continue practicing until they’re satisfied. "There is a great sense of community within the Montessori classroom, where children of differing ages work together in an atmosphere of cooperation rather than competitiveness. There is respect for the environment and for the individuals within it, which comes through experience of freedom within the community." "The most important period of life is not the age of university studies, but the first one, the period from birth to the age of six." Order is of utmost importance to a child under 6. There is a lot of scientific basis in this pedagogy to ensure that the environment is carefully decorated with the appropriate materials based on the child’s developmental needs. Care is taken to ensure not to put in cheap materials, but have as many wooden or natural materials as possible. The walls and décor is intentionally left bare to ensure that the child is not overstimulated by the graffiti on the walls, but enticed by the materials on the shelves instead. Anthea is conveniently located in the heart of HITEC city. Keeping in mind the convenience of working parents, Anthea also provides day care facilities. "The child who has felt a strong love for his surroundings and for all living creatures, who has discovered joy and enthusiasm in work, gives us reason to hope that humanity can develop in a new direction." "Our aim is not merely to make the child understand, and still less to force him to memorize, but so to touch his imagination as to enthuse him to his innermost core." At Anthea Montessori, our lead teachers either join us with a Montessori teaching credential, often from an AMI Training program, or complete their training while employed with Anthea. All the Assistant Teachers also undergo rigorous training, mostly with AMI. 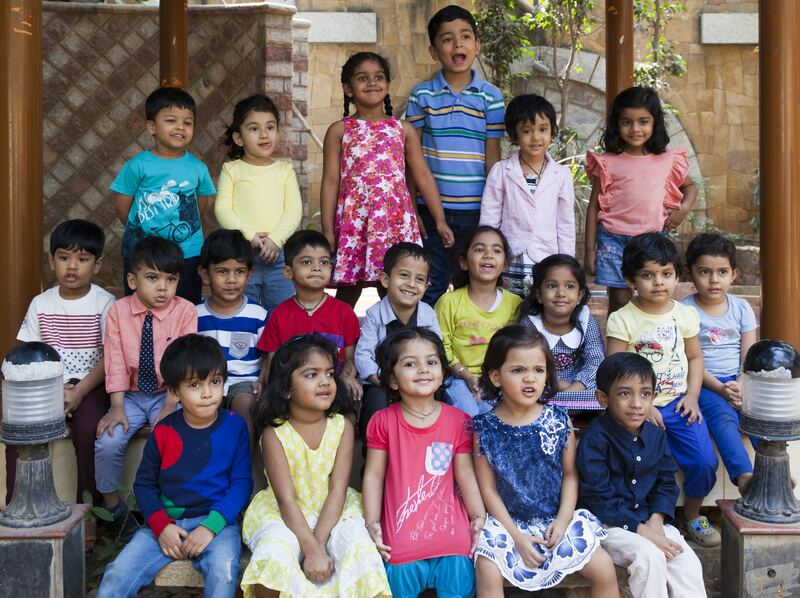 Each Anthea Montessori campus is lead by a Montessori-trained Head of Centre. This experienced master teacher has the full time job of monitoring all the classes at campus and ensuring consistently high standards. The Head of Centre regularly observes in all classrooms, provides feedback to teachers to help them improve their practice, and actively works with parents to resolve any student issues. Our deep belief in the efficacy of the Montessori pedagogy has motivated us to spread the philosophy as far and wide as possible. We send home detailed reports on the child, so that the parents are fully aware of the progress. Regular workshops for parents helps them understand the philosophy to practice some of it at home as well. We regularly update our Facebook page with very useful information. We even train the household help that engage with the children to make sure that the child has a uniform experience throughout the day. We have a very active parents’ Montessori material reading club as well as Thursday Talks involving external speakers. Tie-ups with regular / Montessori schools for graduating Antheans rounds off some of the initiatives we have taken to make parents an integral part of their child’s development. "We must support as much as possible the child's desires for activity; not wait on him, but educate him to be independent." "The greatest sign of success for a teacher... is to be able to say, 'The children are now working as if I did not exist.'" Free play is important to children, and we encourage parents to provide imaginative play activities at home. We also know that the child has the absorbent mind between the ages of 0-6 years and we hone in on the sensitive periods that nature has provided us, with the experience of trained guides, to help the development of the child. Given the right environment, children are eager to learn through exploration and practice. Children, in a Montessori program, are surrounded by exciting opportunities to develop their skills essential for everyday life: they learn to button themselves, lace their shoes,open their lunch boxes, pour water in aglass and drink, clean their spills, cut with a pair of scissors and so much more! The activities we offer in the toddler class provide a welcome change from what children typically find at home. A Montessori environment offers grace and courtesy lessons such as giving the child the necessary language to express his or her feelings. “I don’t like it when you step on my blocks” or “I am angry because you shouted at me” etc. The teacher model benevolent behaviour and always offer choices instead of giving a time out! The directress is always shaking the child’s hands and looks them in the eye while greeting them. They bend down to the toddlers height to talk to them. The focus is on training the individual rather that expecting conformity of the group. They don’t expect a toddler to share randomly but validate the child’s inner needs. There is a focus on devoloping inner discipline which will eventually lead to self-discipline rather than obedience training. We do not offer praise or punishment as we want the child to be an independent thinker. We focus on developing the child’s self approval rather than looking upto his/her peer or adult for approval. We want the child to act on his own accord as opposed to fear! We teach the child respectful behaviour by modelling rather than enforcing. "We discovered that education is not something which the teacher does, but that it is a natural process which develops spontaneously in the human being." "We teachers can only help the work going on, as servants wait upon a master." We have mixed ages in a classroom because of its multiple benefits. The younger children learn from their older classmates as opposed to a teacher. They learn the necessary skills needed such as patience, caring all from their peers. The older child practices his/her leadership skills and mentors the younger ones. The classroom mimics a mini world for the child where the children learn to collaborate with same age and older children. We invite you to come visit us so that you can see the Montessori, and the Anthea, edge yourself. Most parents who have oserved our environments are always surprised, as they have never seen their child this calm and composed. This is the magic that a developmentally appropriate, calm and orderly environment can weave in a child.